As you can see pictured above, the box itself is absolutely beautiful, perhaps due to the primary artist, Eduardo Garcia, as well as the efforts of other artists, Chase Velarde and Peter Wocken. 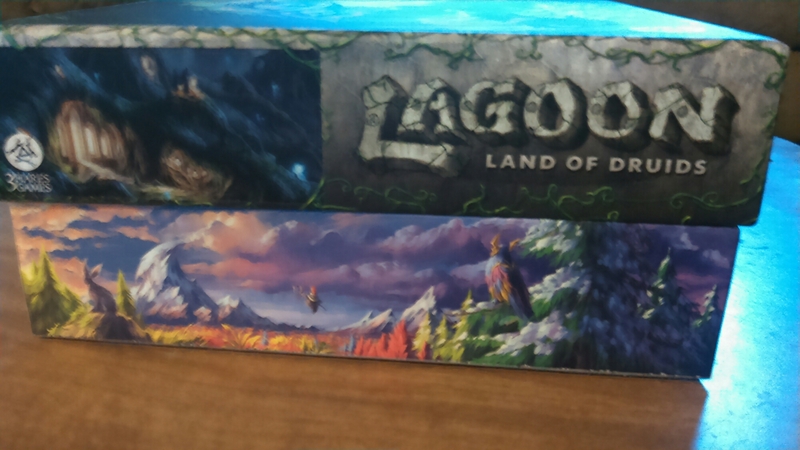 Upon lifting the rather thick top portion of the box, I was delighted to see that all four side panels (top and bottom) had unique scenery as well (all pictured below). Each panel depicts one of the ancient lords of the druidic paths in Lagoon. 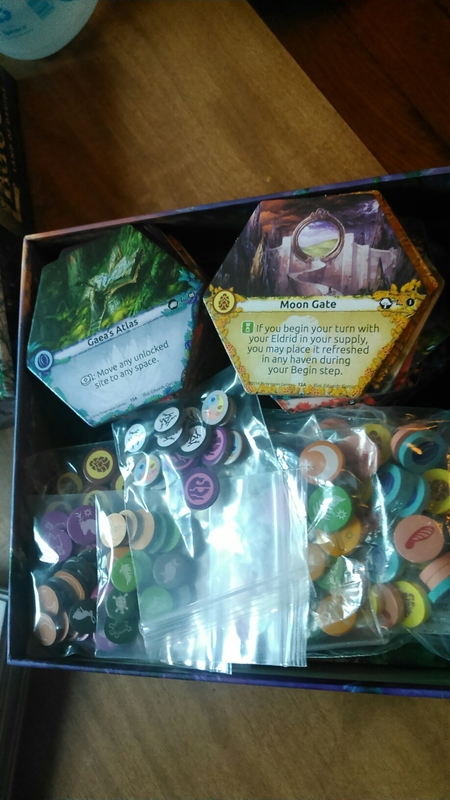 This hefty box came jam packed full of the components and extras, such as the additional painted wooden tokens, a set of plastic bags to store every thing except the large tiles, the special site tile, and the extra druid tokens unlocked via stretch goals in the KS. 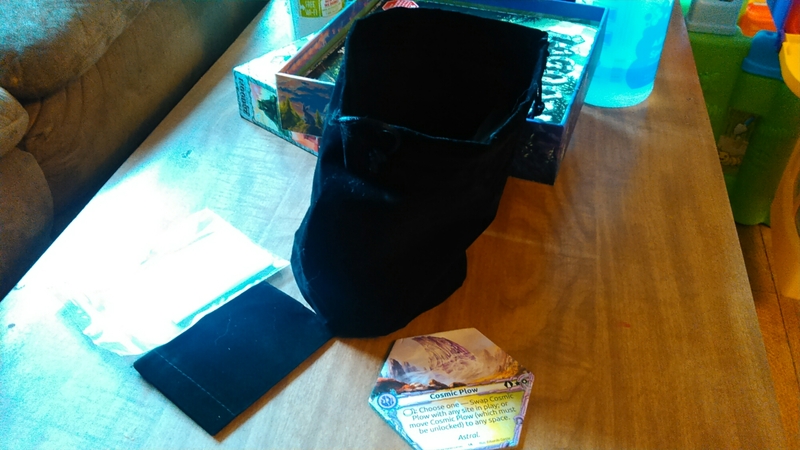 These items were included in addition to the base retail contents, such as the player cards, draw bags, rulebooks, and the punch board inserts. 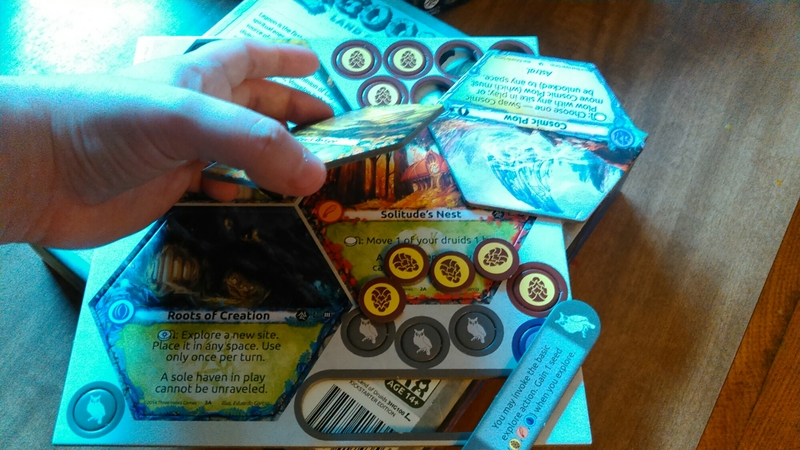 The base retail copy of the game does not come with the special wooden tokens (though that’s not to say that they can’t be purchased separately or as part of a later expansion) and only one set is required to play the game, but it also includes the 3mm thick punch board tokens and tiles (pictured below), which were amazingly detailed and sturdy. The wooden tiles were expertly crafted; perfectly cylindrical, immense in thickness but not too weighty, the printed symbols are crisp with very few instances of smearing or bubbling. 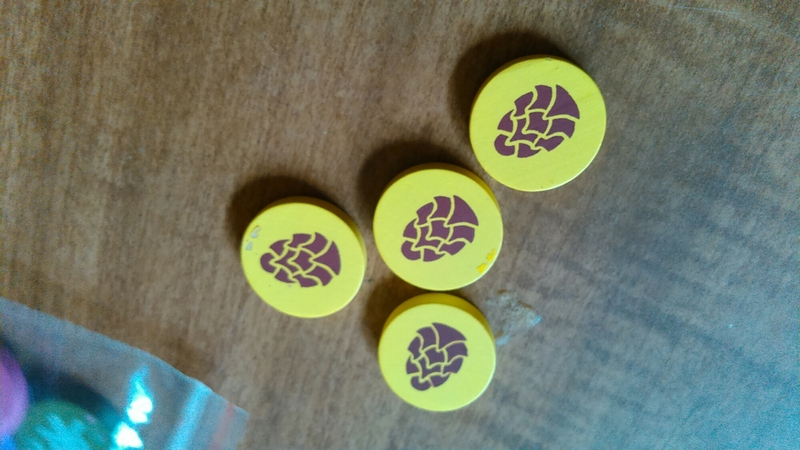 One small problem I (and some other backers) ran into was having a few tokens come adhered together by the paint. This was not a terrible error, as they were fairly easy to separate and only a fraction of the pieces were stuck; it was obviously a result of the manufacturing process, probably due to the paint not being totally dry before the tokens were placed in the bag together. There was only minimal damage, especially with the larger tokens (the smaller tokens had more stuck together and a couple came away with extra peeling), and the pieces are still completely able to be used; much of the damage (some blurred/scuffed/peeling paint) is barely noticeable. 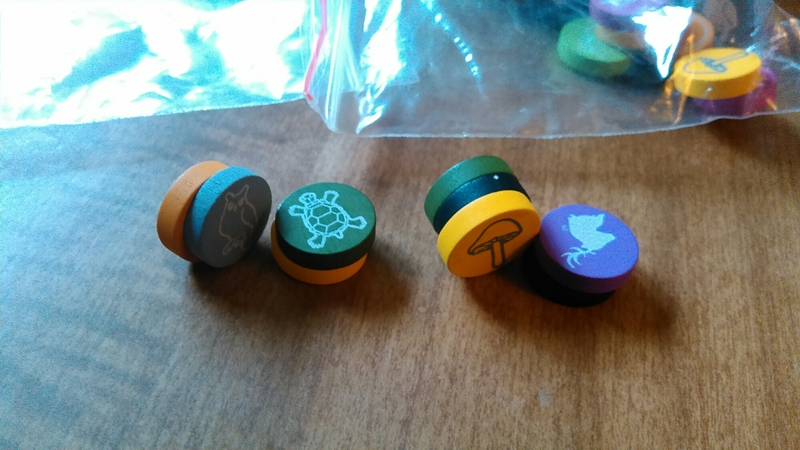 The larger wooden tokens have incredibly slight peeling from being stuck together. 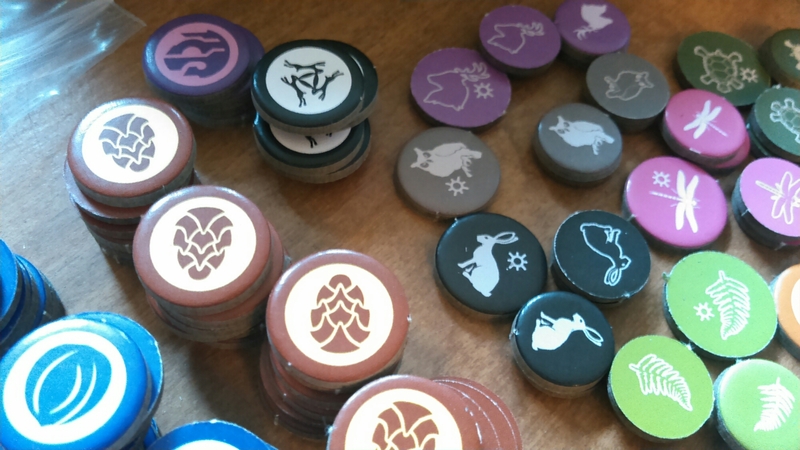 The smaller wooden tokens were more difficult to pry apart, probably resulting in a bit more damage than the larger tokens. The draw bag (standing upright in the picture below) is made of a sturdy material, and kept standing on its own with very little effort on my part. It is more than large enough to hold all of the punch board tiles, and probably the wooden and punch board tokens as well if so desired. Graciously included was a set of small, clear, plastic bags for storing the tokens however you like (this is pictured later, after I had punched out and sorted all of the pieces), as well as a smaller bag for holding specific tokens. 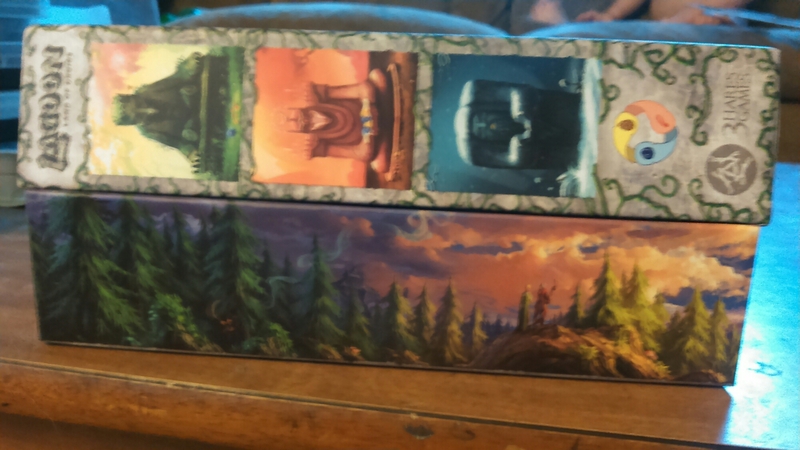 Also pictured is the special “Totem Site Tile”, which was unlocked through higher stretch goals and is a real game changer for advanced players. It is of the same 3mm thick board that the other tiles are made of, but it came separately due to its unique value and special addition. The rest of the tiles were sitting in the bottom of the box, secured in the un-punched inserts. 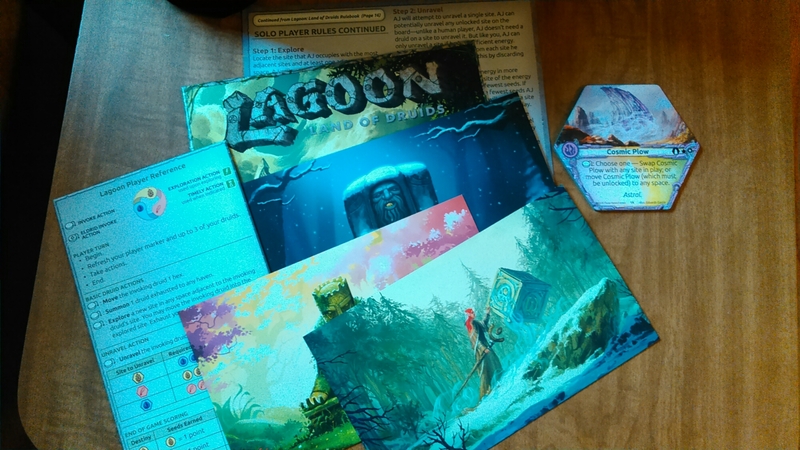 I feel the need to comment on the superior make of the inserts themselves; not only is the punch board chunky and durable, but the print is detailed and clear, the images are without blurring or printing mistakes, and the punching process itself was remarkably easy (and dare I say, fun.) I’ve never had punch board components come away so readily without tearing, especially ones so thick, or without some of the pieces coming accidentally pre-punched from jostling during shipping. 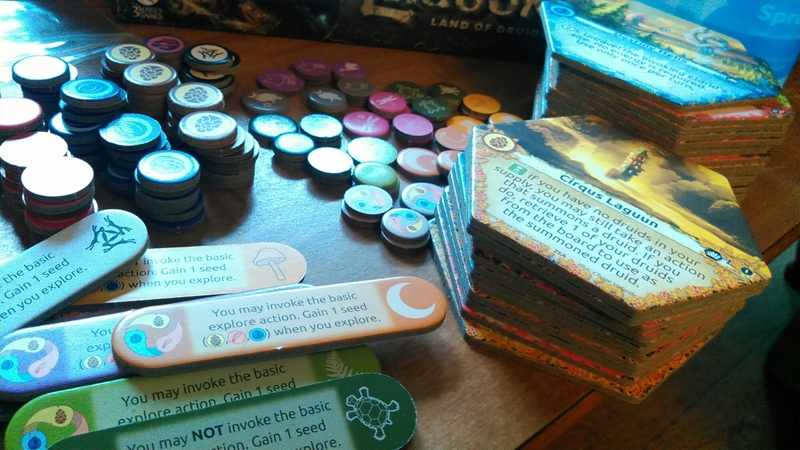 The seed tokens (left side, above) and the druid tokens (right side, above) all punched easily and stacked well, are very clearly differentiated by color (and image, for any colorblind folks who may otherwise have difficulties), and are of varying sizes so that they may not be confused so easily at first grab. 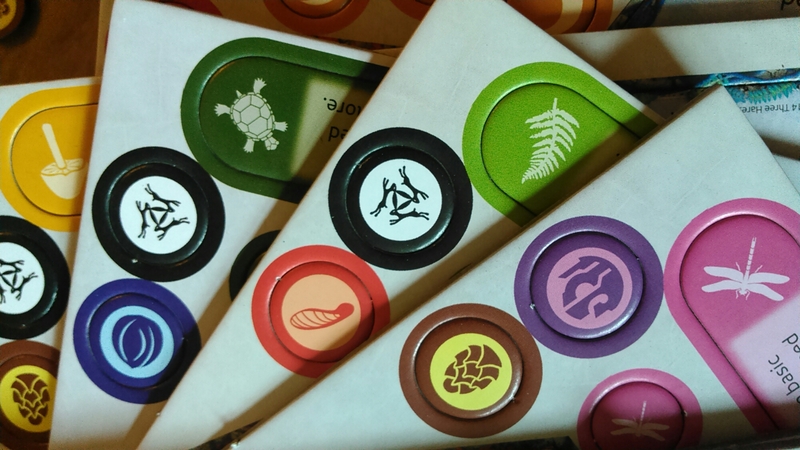 The designs are printed beautifully and cleanly, both the outlines and the solid designs (as is the case with the druid tokens) are clear and legible, with whimsical, earthy graphics detailed upon them. 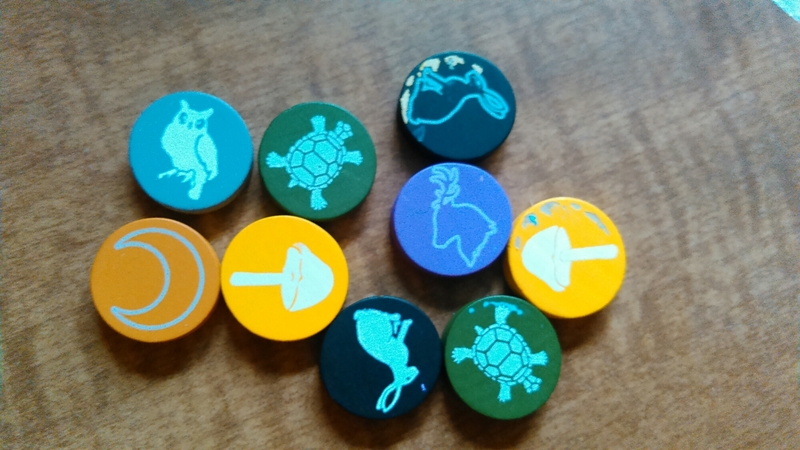 There were even some extra token designs added due to unused space on the punch board inserts; the 3 Hares Games logo and an interesting purple design are featured above, for example. These particular designs do not currently have a purpose, but Mr. Chott was very generous to include them rather than not! He also postulated that they may have future use in further expansions, or in fan-made rules and play styles if the players should experiment with them. 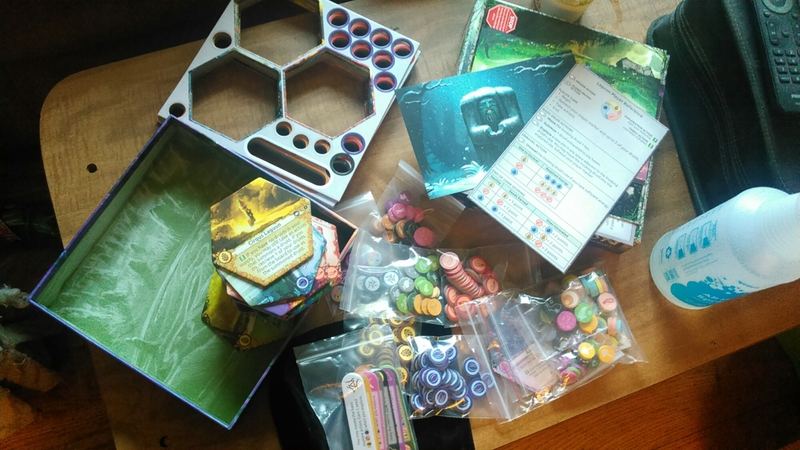 After I had gotten everything punched and sorted, there was a newfound bulk in components; thankfully, all except the site tiles fit easily into the ready plastic bags mentioned earlier. 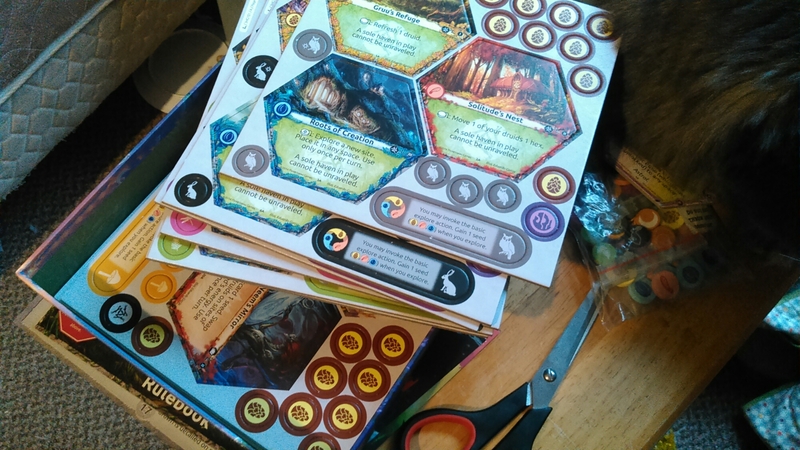 Though this game can only tolerate a maximum of 4 players, there are 8 druid factions to choose from (half of these were unlocked stretch goals) and a player marker (the long pieces in the bottom left corner, pictured above) for easy reference for each different path! Even without the extra wooden tokens, this game ended up having some serious heft to it. 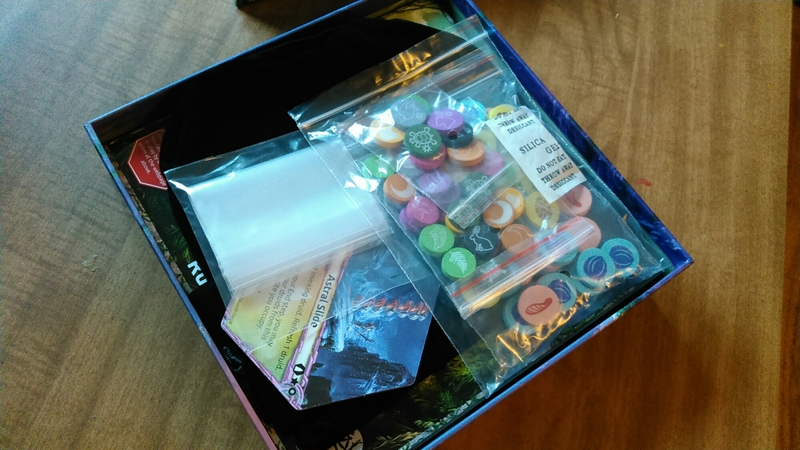 In the future, I may look into making my own custom box insert to properly hold and separate everything, but for now, the baggies work nicely and everything fits inside the box without making extra accommodations or having too much sliding around. And talk about going all out on the art, even the inside of the bottom has a lovely design! 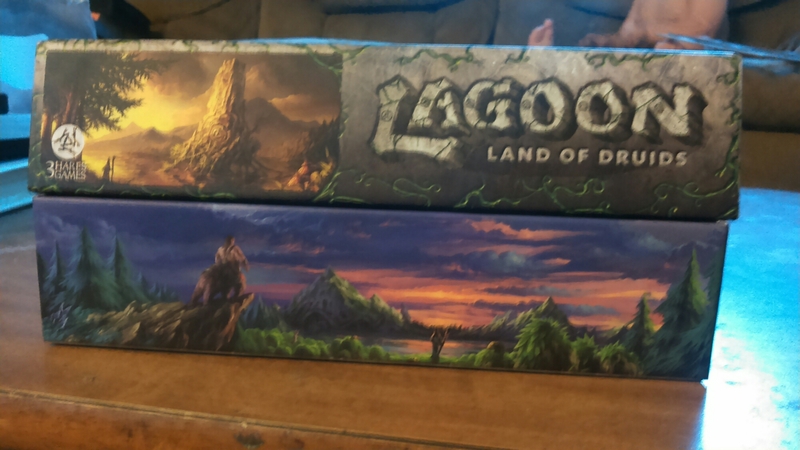 With each site tile offering a different location and illustration on both sides, the unique druid token designs, and the player card and box graphics, we are given a wide view of the beautifully detailed world of Lagoon. This scope can only increase with further expansions, as well as hinted stories and background into the lore of the druids, this world fast taking shape right before our eyes as we play. Altogether, the quality of the product (sans actual game play, which I can be assured is stellar by reviewers) far exceeded my own expectations and Mr. Chott’s initial goals and hopes for the project. He spent a lot of time play testing, designing the components, approving all of the fantastic artwork, and approving proofs and trial tokens until he could give us the highest quality game possible. I’d definitely say he’s succeeded. 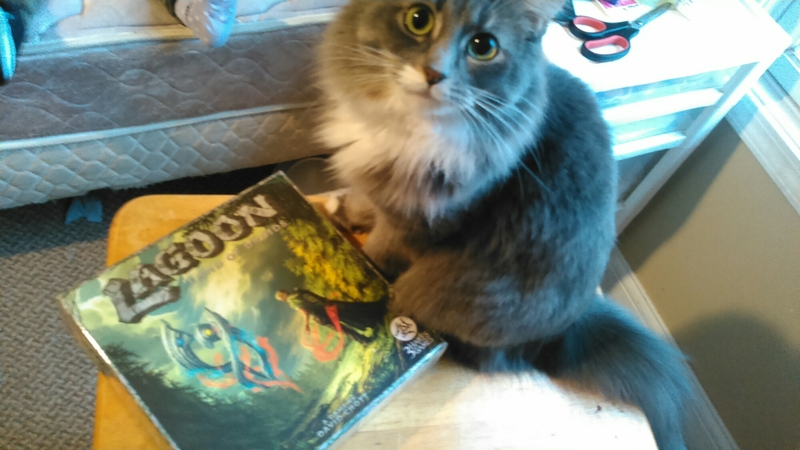 This game has recieved the Bear and Marcus stamp of approval, and that's not just because of the box. 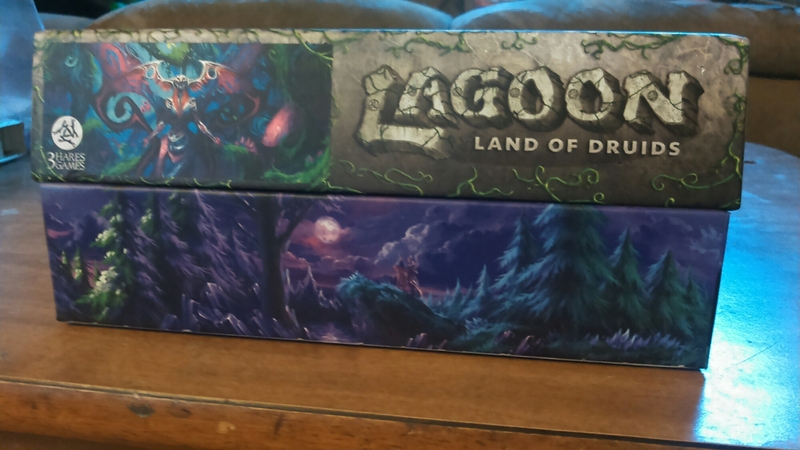 This entry was posted in Other and Everything, Product Review and tagged 3 hares games, board game review, lagoon land of druids, product quality review. Bookmark the permalink.